Tonight is the premiere of the second season of the A&E television show Hoarders at 10/9c. We’ve written a few times about the first season of the show, and even heard from people who have been featured on the program in our comments section. I continue to have mixed feelings about it — I love that it is bringing a human face to this mental health issue and raising awareness, but I wish that there was less shock and awe factor in what is broadcast. We’ve heard from a number of people associated with the show that the second season is going to talk more about treatment options and look more closely at the psychological aspects of the disorder than was the case in season one. I truly hope this is accurate because I believe the hoarders on the show deserve to be treated with dignity and respect. I’m not saying that they weren’t in season one — I know from first-hand accounts that they were given excellent help behind the scenes during the filming of the episodes — but what translated onto the screen didn’t always reflect the entire process. I’m looking forward to tonight’s episode and seeing how the changes are implemented. After the episode airs, feel welcome to jump onto our Unclutterer Forums and talk about it in our second season Hoarders thread. If you don’t get A&E, check out the official Hoarders website in a couple days where they will post the full episode online. In our fifth installment of Unclutterer’s 2009 Holiday Gift Giving Guide we’re discussing charitable giving. In our 2007 Guide, we suggested charities that you could donate to in someone’s honor. We continue to love this idea and suggest checking out Charity Navigator and Charity Watch to learn about legitimate charitable organizations. Giving to charities is nice because it’s completely clutter-free for the person honored through the gift. Join the bone marrow registry. Cut off your ponytail and donate it to Locks of Love. Donate needed items to a food pantry. Volunteer your organizing talents to a group in need. In what ways do you plan to donate to people you don’t know? We’d love to read about your ideas in the comments. Also, don’t forget to check out our Unclutterer’s 2009 Holiday Gift Giving Guide Index Page for a listing of all the articles as we publish them. If someone believes that they can’t wait until you return from your vacation to get into touch with you, they can use AwayFind to get an emergency message to you. Now you can speed up the dry time by up to 75% with the Sweater Dryer with Fan. This week’s Workspace of the Week is Bullismaureen’s super secret office in an ottoman. Mail it back with USPS! 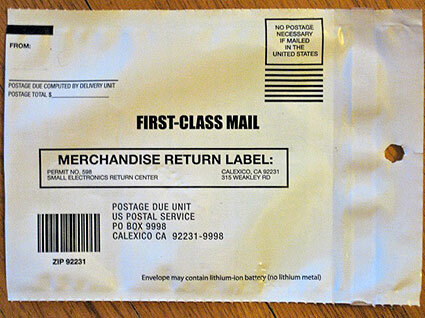 In select Post Offices, customers can get free mail-back envelopes for recycling inkjet cartridges, cell phones, PDAs, digital cameras and other small electronics. If you’re heading to the Post Office to mail holiday presents, you might as well get some small electronics clutter out of your home and safely recycled for free. If your local Post Office doesn’t currently carry the bags, be sure to request them at the counter. In our fourth installment of Unclutterer’s 2009 Holiday Gift Giving Guide we’re discussing the ultimate gift of our Guide. Being serious for a moment, compared to the price tags on the previously selected ultimate items, Unclutter Your Life in One Week is a steal at less than $15 through Amazon. If you purchase the Kindle version, it’s even less expensive at just under $10. Also, I truly believe it’s an amazing gift to share this holiday season, even if it was blatantly obvious that I was going to pick it. That being said, you do have to be a little, um, sensitive with giving a gift like this. You can’t hand the book to someone and say, “You need this.” You should use a little finesse. Say that you’re a fan of the website, that you read the book and liked it, and that it’s great preparatory reading for anyone with “Get Organized” at the top of their New Year’s resolution list. Maybe give another book or two along with it, something funny. You can even say that you’re thanked in the Acknowledgments section (Unclutterer readers are thanked first, so it’s totally true). You’ll figure out a way to make it work. The Unclutterer staff would like to wish everyone a happy Thanksgiving! On our list of what we’re thankful for again this year is you, our Unclutterer readers. You’re truly amazing! 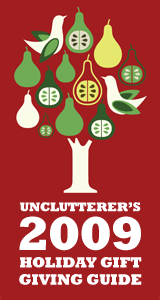 Check back tomorrow for another installment of our Unclutterer’s 2009 Holiday Gift Giving Guide. If you’re not in the U.S. and not enjoying a day off from work, jump into the Forums and join the conversation. Happy Thanksgiving! To get us all into the Thanksgiving spirit (and those of you outside the U.S., feel welcome to laugh along), I present to you synthetic Lucky Break Wishbones in packs of 4, 5, 8, or 10! Now you don’t have to prepare five turkeys just so all your guests can participate in wishbone-breaking fun! I think we’re all in agreement that gathering together with family and friends, sharing in good conversation, and eating an amazing meal is an unfulfilling experience without the wishbone. 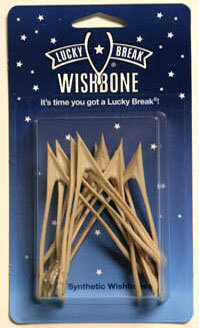 With the Lucky Break Wishbones your guests won’t have to worry about how they’re going to get lucky! Give a classic digital education. The History of the English Language, Physics, and Calculus are just three of hundreds of courses offered digitally by The Teaching Company. Lectures from the best professors in the world are perfect for anyone who wishes she paid more attention in high school or college. When I was commuting for an hour a day, Teaching Company courses kept me sane. I greatly enjoyed doing something productive with my time on the road. Take a class together. Has your wife been nagging you to go out dancing more often? Register for a ballroom dancing class together and get her a CD of practice music recommended by the instructor or a pair of required shoes to unwrap announcing the gift. Have you and your friends been talking about taking a cooking class together for ages? Sign up for a class at your local culinary school, favorite restaurant (if they do such things) or cooking store and enjoy the time with your pals. Give the gift of language. You may not be able to fund an entire vacation to France for someone you love, but you can get him prepared for his dream vacation with French lessons from Rosetta Stone. They’re expensive, but incredibly effective. With more than 30 languages to choose from, you can help your gift recipient experience the world. Give the gift of music. Find a local music teacher and pay for someone you love to take music lessons. If you don’t know anyone locally who teaches the instrument or your gift recipient has an already busy schedule, check out sites like Homespun Music Instruction that sell exceptional training DVDs. My husband has the Great Mandolin Lessons DVD and it is phenomenal. Fund a semester. If you can swing it, help a student pay for books, housing, or tuition for a semester. The recipient will always remember your generosity. Have you given an educational gift in the past or are you planning one for this year? Give us your suggestions in the comments. Also, don’t forget to check out our Unclutterer’s 2009 Holiday Gift Giving Guide Index Page for a listing of all the articles as we publish them. My wife and mother-in-law have a tradition of waking up at an absurdly early hour the day after Thanksgiving to brave the crowds for the best deals of the season. To help overcome my inability to learn lessons the first time, I have devised a new series of questions to ask myself at the end of the work day. This year, we’re getting my brother a Netbook for Christmas. We found a Compaq Netbook with Windows XP for $179.00 through BestBuy’s Black Friday Deals, and decided it was the right gift for the right price. How does a gift like this reflect what matters most to me? My family is my largest priority and being in solid communication with them comes ahead of most everything in my life. Part of this includes my son growing up talking at least once a week with his uncle, and this Netbook will make that possible across the miles (my brother lives more than 1,000 miles away). The Netbook has a webcam built into the monitor and works wonderfully with Skype, and also accesses the internet so that he can see family pictures and videos we upload to Flickr. My brother doesn’t currently have a home computer or a webcam, and so this little Netbook will make it possible for my son and brother to develop a more meaningful relationship. If spending time with your family is also a priority, gifts like airline tickets are nice so that the recipient can come to visit you. Create a “redeemable for one free trip to see me” coupon and then buy the ticket in the person’s name when you and the recipient figure out the best travel date. If the family member lives within driving distance, give a gasoline gift card in an amount to cover the expense of fuel for the trip. The recipient gets a vacation and you both get to spend time with someone you love. Monthly reservations. Do you have a friend you would like to see more often? Choose 12 restaurants you’ve been wanting to try and make reservations for once-a-month dining in advance. Give your friend a calendar with the plans already marked on the dates. Offer to pay for one or more of the dinners (Your birthday month is on me!). You can always reschedule the reservations if something pops up or you decide you want to try a different place, but if there isn’t a conflict you’re set for the entire year. New adventures. For my sister-in-law’s birthday last year, we bought her a robot kit and a bottle of wine. We also bought two robot kits for ourselves. We then set a date for when we could all get together and spend the afternoon building our little creatures. A few weeks later we pretended to be engineers (sober engineers, I might add — we discovered wine did not go well with hundreds of itty bitty pieces in our kits). She had never built a robot and loved the idea of building one, and we hadn’t ever built them and loved the idea, too. Plus, we laughed our way through the entire adventure. We got to spend the day with someone we love doing something we’ve always wanted to try, and the same was true for my sister-in-law. Are there new adventures you could share with someone you love? As we continue to post more ideas for the Guide, check out the Unclutterer’s 2009 Holiday Gift Giving Guide Index Page for a listing of all the posts. Yesterday we came across this amazing YouTube video of a Good Morning America segment profiling Kathy Spencer, who runs How to Shop for Free. By using a few techniques highlighted in the video, she manages to feed her family of six for less money than you probably have in your sofa cushions right now. People always say why get something if you don’t need it, or say I don’t need 10 jars of peanut butter. My answer to that is if you don’t need it someone else will. I did not need the 6 diabetes monitors that I picked up at CVS while shopping with Inside Edition but I got them because I will be donating them to my local Council on Aging, a lot of people have diabetes and don’t test regularly because they can’t afford the meter. If you’re willing to actually make an effort to find a good home for such “deals,” then it’s probably not a bad thing. If not, you should probably be much more critical about whether you really need something that’s on special. It’s actually quite surprising to see how much money you can save with a little planning and effort. We tried out some of Spencer’s tips yesterday at our local Harris Teeter and managed to save about 30% off our total bill. And if you need a way to organize your coupons, check out this Unclutterer post from March on repurposing brag books.